Rajasthan is known as "The land of kings", and is the largest state in the Republic of India. This house was high up in the mountains and the family who owned it allowed us to house the rescued children there until such time as we raised the funds and built the orphanage. The Thar Desert or Great Indian Desert is a large, inhospitable arid region in the north western part of India and forms a natural boundary running along the border between India and Pakistan. With an area of more than 200,000 km2 (77,000 sq miles) it is the world's 18th largest subtropical desert. Rajasthan is famous for its quarrying and mining and is the second largest producer of cement in India. It also has rich salt, Zinc and copper deposits. The Taj Mahal was built from the white marble which was mined from a town called Makrana. Sharing Hands is also involved in the rescue of vulnerable children many aged between 5 and 12 years of age. All these children were the victims of forced child labour, child trafficking for sexual abuse and organ trading, and bonded slavery in factories and marble mines in Rajasthan, central north of India. The only reason the children in the factories and mines were handed over is because they were dying and of no further value to their owners. These children had to be carried out to vehicles as they were to unwell to walk, and each child had to spend 1 month in hospital under medical care. They were then taken to a house in the mountains which was to be their home until we could purchase land and start the construction of the orphanage. Rajasthan - An Irish Project. Sharing Hands gave this to me as an Irish project. Fundraising started immediately and in 2009 we bought land and started the construction. In July I visited the children in their mountain home and viewed the construction as it got under way. When I revisited Rajasthan 2010, the children had already moved into their new home, which was supervised by two full time women staff who lived on the premises. The children were also attending school which was only a short walk away and all had school uniforms, books, pencils and bags. Kind Hearts of Irish Sponsors. This is all due to the kind hearts of the Irish sponsors who have taken on to support these children and to all extensive purposes have become their father and mothers. By 2010 there were that many children rescued, that there were now 3 times the number of children in the orphanage then it had been designed for. Sharing Hands had to also hire out a house in a nearby town to take the overflow of children. This is where it all started, with a couple who had a vision and a heart for the unwanted children of India. It was through the love and sacrifice of John and Rachel that has brought about the birth of Sharing Hands. 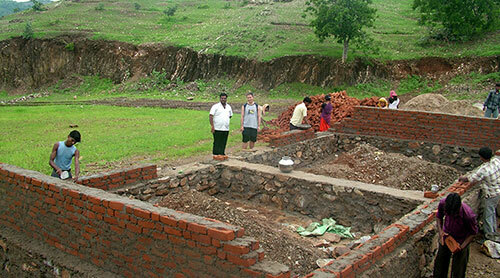 The Rajasthan orphanage project was given to Tommy Marrett by Sharing Hands as an Irish project. Within a few months the funds were raised to buy the land and lay the foundations for what now has become a home for many children who have come from difficult backgrounds. The children in the Orissa home have some of the most heart breaking stories of them all. Many of them had seen their parents, grandparents and family members killed and now live with these terrible memories. All these lovely beautiful children eat, sleep and live on the floor of a small church. But every time I meet them they are full of happiness and joy and thank God daily for the blessings for what they have. This is one way in which each and everyone of us can help. Between us all we can make a difference to the lives of these children.